Dinner starts at 4:00 PM. Show starts at 5:00 PM. Branson Murder Mystery Dinner Theater presents a NEW EXCITING SHOW for 2019 “Murder at the Town Vote” and gives Branson another hilariously live dinner theater experience! You’ll find the same zany- crazy characters attempting to solve another unfortunate murder in Branson. We even have some of the same hilarious routines from last year by audience demand. New show! Great Cast! Crazy, New Fun! Everyone is getting ready for the town vote when suddenly there is a mysterious death. This is where the story, and the insanity, begins! You have the opportunity to jump in on the action, or simply enjoy everyone else in their new role in the show! 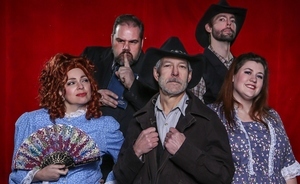 There’s never a dull moment in “Murder at the Town Vote.” You’ll enjoy trains a whistlin’, guns a shootin’ and folks a yellin’ at this fun family dinner show. Hey, you could even turn out to be the murdering scum yourself. • Baked Chicken: The chicken is brought in fresh daily.